"Holiday Shopping. 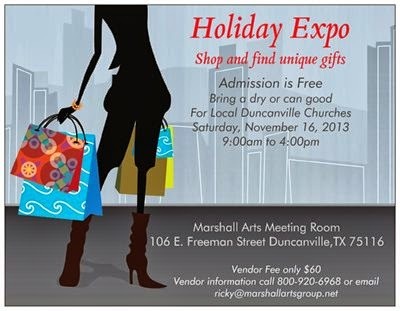 Come to Downtown Duncanville and find unique items. Admission is free. Bring a Can Good to give to local Duncanville Churches." Booths are 6 or 8ft tables for $60. Applications are available here and are due by November 11th, 2013. For more information, contact their event coordinator at msarchie@marshallartsgroup.net / 800-920-6968.